NEWARK, N.J. — John Tavares scored twice and hit the 300-goal mark for his career in leading the Toronto Maple Leafs to a 4-2 victory over the New Jersey Devils on Thursday night. 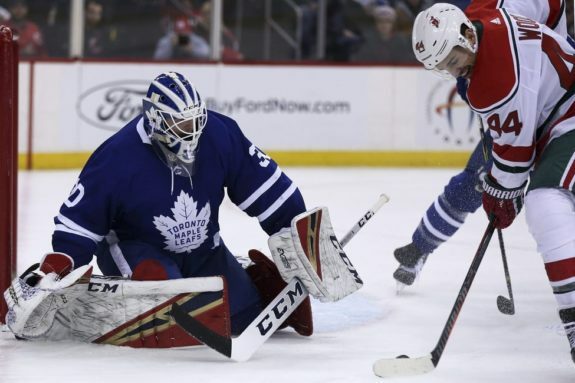 Defenceman Ron Hainsey also scored in Toronto’s three-goal first period and third-string goaltender Michael Hutchinson made 27 saves as the Maple Leafs beat the Devils for the third time in as many games. Mitch Marner added an empty-net goal with 22 seconds to play. The Devils were outshot 15-3 in the third period in losing for the fourth time in five games. NOTES: The Devils placed G Mackenzie Blackwood (lower body) on injured reserve and recalled F Kevin Rooney from Binghamton (AHL). … Toronto’s Zach Hyman had an assist in his first game after missing a month with an ankle injury. … Reigning MVP Taylor Hall (lower body) missed his eighth straight game. … Kasimir Kaskisuo was recalled from the AHL Toronto Marlies on emergency basis to back up Hutchinson.